Last week, comScore, Inc. released data showing that 175 million U.S. Internet users watched online video content in October 2010 for an average of 15.1 hours per viewer. That averaged out to about 30 minutes per day, up from about 16 minutes a day the prior year! The online video watching population covers 84% of the total U.S. Internet audience, which suggests that online video is rapidly becoming a common activity for the online audience. 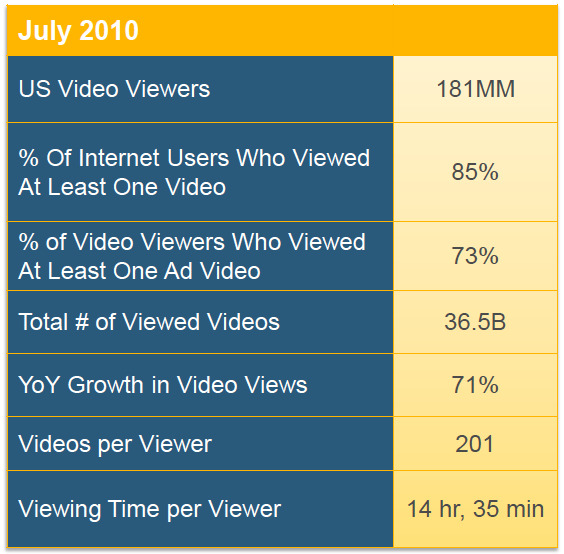 ComScore data in July also showed a 71% growth in video views, comparing year over year. Along with growth in pure number of views, growth in long-form content has been a big story this year, as sites like Netflix and Hulu stream more traditional TV and movie produced content to the web. The introduction of new content types has contributed to the doubling of time spent streaming over the past year, from 8.3 hours per viewer to 14.6 hours per viewer in the span of a year, and has bumped up the average length of online video to 4.3 minutes. 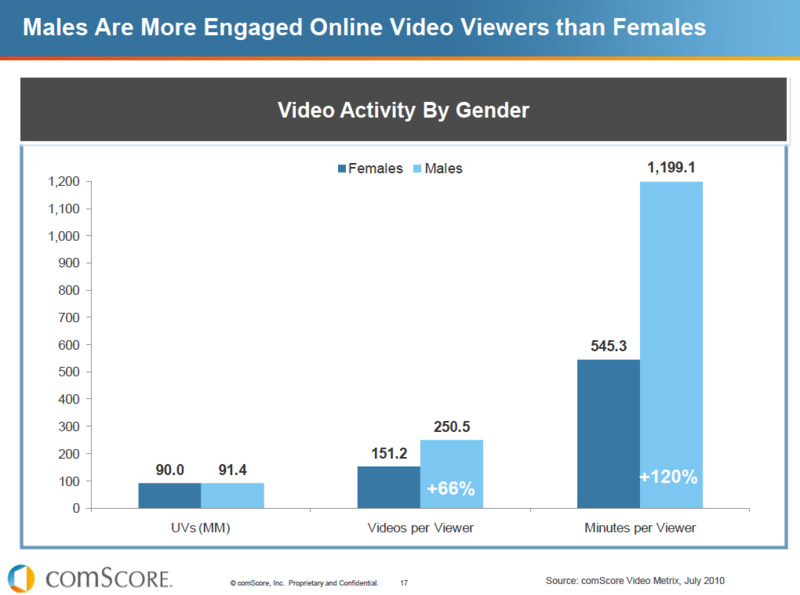 Interestingly enough, comScore also found that while unique viewer numbers are nearly equal across genders, engagement is much higher in male viewers, who demonstrated a 66% increase in comparative number of videos per viewer, and a 120% increase in comparative minutes per viewer. Seems like this should have some interesting editorial implications for gender-targeting brands like cosmetics or skin care, as explored in the recent Old Spice viral campaigns. 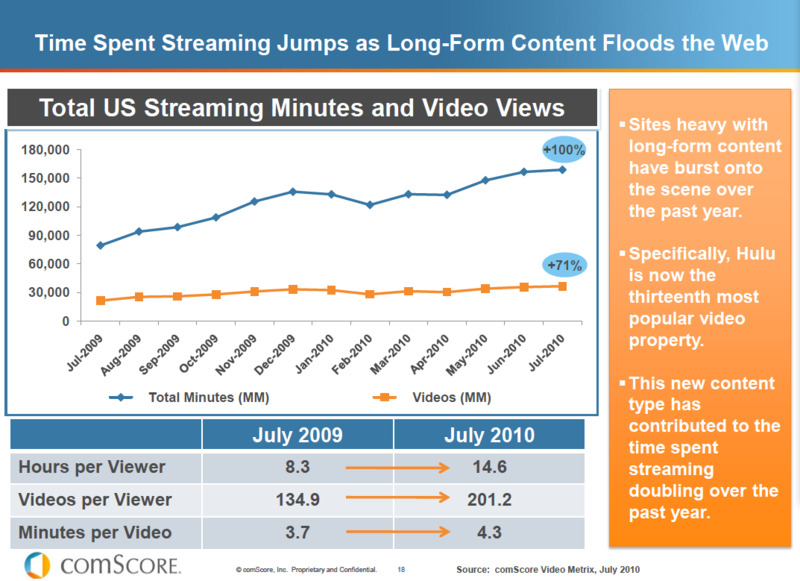 For more details, see the comScore Press Release. What's stopping you from being a part of this trend and reaching an increasingly engaged online video audience? Get started by activating a Brightcove Express account before November 30* and receive an Apple iPad, iPod Touch, or Apple Gift Certificate for opening your account. Activate your account today and receive your new device in time for the holidays. *Terms & Conditions apply. Please see the full rules for eligibility.